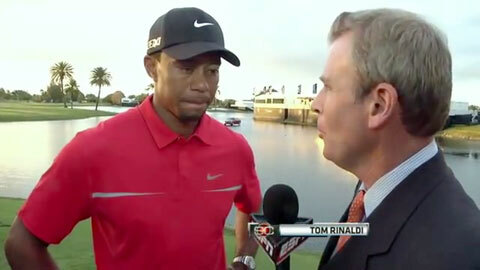 In an ESPN video interview with Tom Rinaldi, Woods talks about his victory at the WGC-Cadillac Championship and his putting lesson with Steve Stricker. Tiger is now given 4-to-1 odds to win the Masters at the Augusta National, with Rory McIlroy slipping to 9-to-1 despite his final round 65 on Sunday at the WGC-Cadillac Championship. Phil Mickelson comes in at 10-to-1. Tiger Woods is probably the greatest golfer ever to play the sport. PFP Sports and Celebrity Talent Agency is a top booking agent for PGA golfers such as Phil Mickelson and Rory McIlroy. If you would like to hire a pro golfer, contact us at 1.800.966.1380.